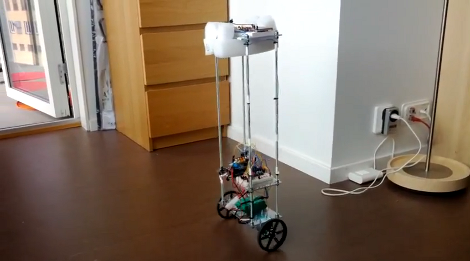 It’s pretty cool, but I am not sure what the point of having a 2 wheeled balancing robot is for. You could just add a 3rd swivel wheel somewhere and it wouldn’t need to self balance. Awesome build and work, just not sure what a 2 wheeled robot is useful for (except for maybe a bike configuration). If you bump this it’ll stay up. If you bump a 3/4 wheel, it has no way to keep itself upright. Imagine a toolbox, drink table, etc that follows you – that won’t fall over if it bumps into something. That said, those designs would require additional engineering to be useable/functional. Maybe a 4 (or more) wheeled platform with swiveling wheels that have a lot of negative camber? Perhaps (if the wheels are mounted on legs) the legs themselves could come out at an angle. Don’t get me wrong, I just have yet to see a really solid implementation of this idea. For the immediate time being, even if a half-decent self-balancing robot can be made, the next table that follows you is still more likely to use “dumb” wheels. The problem is the extra weight. The motors would have to be stronger, and the feedback loop would have to be quicker. It’s not as simple as just putting a large flat surface on top of one of these. Even the placement of your tools/drink will affect the balance of the robot. It’d be very annoying to have this whole surface available to you, but only feel safe putting things in the middle. Judging from the way this thing wobbles (not a criticism, but it does) I thought this would be a hilarious drinks tray. “rites of passage”, not “rights”. Either way, it’s a nice build. Hmm. . . it looks like the end result of a multi-Arduino PID loop is a system that is “hunting.” Maybe it’s a simple tuning issue? Need to account for the spring constant of the tower of flexible rod. The PID loop seems to be ringing. Yeah, at abt. 2 Hz. Should be possible to tune that out. The response time of a physical PID controller is much faster than the response time of microcontroller PID algorithm. A physical PID controller operates in real time, while a microcontroller PID algorithm can only operate at a fraction of the clock speed of the micro. For example, the Arduinos used were likely running at 16MHz. If there was a “PID” instruction in the micro’s instruction set, the best response time you could hope for is 62.5ns. You really have to assume that there will be a couple hundred instructions, at least that perform a PID function. So we can probably assume that it’ll take ~6us to respond to any change. Keep in mind that this is each cycle the “PID” controller tries to match the input. It’s safe to say that you can expect some wobbling. Real life is faster and more responsive than emulation. But even if the table was moving/tilting at 10 meters per second (30ft) it would only move a 0.6 mm (0.02″) in the 6 uS your example mentioned. Definitely worse than a purely analogue solution, but I would assume that the lag caused by having motors with not infinite torque would dwarf that small delay. Don’t humans have a reaction speed of like 20+ microseconds? and they can ride a unicycle on a wire I’m told. In a lot of ways it is a right of passage. It is sort of the traditional introduction to signal and control processing problem. It is an interesting system because it is an inherently unstable system. Similar rights of passage are thermostats and the like, but honestly… The inverted pendulum is much more interesting, especially as a robot. Androbot simply used angled wheels, no fancy stuff required to make their TOPO bots stay upright on two wheels. They did bob back and forth a bit and any more than a slight incline was a challenge. Combine current self balancing tech with TOPO’s drive system and you’d have a self balancing robot that won’t fall down even if it loses power. The three Arduinos reminds me of the story behind the Millennium Falcon. I wonder if these ever argue with themselves? maybe we can all agree that its _any_ PID that is the rite of passage! Made it handle being pushed much better. These sort of designs could be implemented in aids for people with no legs, Imagine that, I see it happening in the future. Anyone could produce it, I don’t see why they don’t.